It’s now officially fall and that means crisp evenings, changing leaves, football, and pumpkin beer. Yes, pumpkin beer. Dogfish Head Punkin’ Ale: Brown ale with wonderful spicy aroma and a dry, graham cracker spice. It’s sweet, bready, and medium-bodied. Buffalo Bill’s Pumpkin Ale: Billed as “America’s originial pumpkin ale,” this cloudy ale has very little head and almost no carbonation. It’s a bit watery with clove flavors and a fresh aroma of pumpkin. Post Road Pumpkin Ale: Made by Brooklyn Brewery, Post Road has a deep copper color and a rich allspice aroma. It’s a crisp, hoppy blend with a flavor that reminds me of roast pumpkin seeds. Shipyard Pumpkinhead: This Maine brew (not pictured) is actually a “malt beverage with pumpkin spice added” according to the label, but don’t let that fool you. The copper-colored beverage has the aroma and smell of sweet pumpkin pie. Harvest Moon Pumpkin Ale: Harvest Moon is the only pumpkin ale I know made by a large beer producer (Coors/Molson). It’s less pumpkiny than many of its counterparts, but has a bit of spice to go with its otherwise smooth, if watery, flavors. Smuttynose Pumpkin Ale: With a dark, cloudy orange color, nice head, and a cinnamon aroma, this is a rich, full-flavored ale. Malty, spicy, and balanced, it would be easy to drink a few of these. Southern Tier Imperial Pumking: This 9% ABV brew has a delicious aroma of fresh pumpkin and vanilla. It’s a step above the other pumpkin ales in intensity and strength. You get the feeling this would be a delicious beer even without the pumpkin flavors, but the rich pumpkin spice adds a new delicious dimension. Any of these beers would go well with a fine cigar. Stronger beers like the Southern Tier, Smuttynose, or Post Road could stand up to a more full-bodied maduro or a Cameroon-wrapped cigar. The other beers need a milder cigar or they run the risk of being overpowered. No matter what you choose, though, I recommend you embrace the season and pick up some pumpkin beer. It may not be an everyday pairing, but when the mood and season strikes, it’s a great change of pace. Like pumpkin pie in a bottle…we add 136 pounds of real pumpkin to the three-barley mash and then season the fi nished beer with cinnamon, nutmeg and cloves. Available September 1. Schlafly's pumpkin is the best I've ever had. I've got it, the shipyard and the harvest moon in the fridge now. Thanks for the article. If you guys had to pick a favorite, which would it be?? I'd be hard to pick just one. I'd say Dogfishhead and Smuttynose stood out. Shipyard is a sentimental favorite of mine. Also, the Punking Imperial is a special beer for the right occasion, but I can't see myself drinking it with very much regularity. I have tried all these except the Buffalo Bill's, as well as some local Boston microbrews and the Dogfish Head is hands down my favorite. But beware, it creeps up on you at 7% ABV. 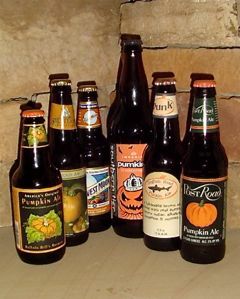 I've just learned of pumpkin beers recently, and followed this post back to your 2009 post. Hoping to pick up a sample this weekend of different pumpkin beers!